When military buyers sit down with prospective real estate agents who market themselves as “military experts,” they will immediately know whether or not that title holds true once the conversation begins. Certainly, an agent who is not familiar with the military can learn on-the-job through the process of taking on military clients. Yet, doing their due diligence and research before taking on military clients will better serve their work. What’s the famous quote? Success happens when preparation meets opportunity. PREPARATION – that’s where we come in. As Hawaii’s longest running, VA loan specialized lender, we’re your resource for working with military home buyers! We’ve spent over a decade helping veterans and servicemembers utilize their VA loan benefits to become homeowners. In that time, we’ve developed a large number of Agent Resources that explain the VA loan process in detail, so that you’re well-studied on what you and your buyer can expect. In the pages of our annual VA Homebuyer’s Guide, we simplify the VA loan process for veterans and servicemembers. The goal is for our veterans to realize that their hard-earned VA home loan benefits can very easily be obtained when working with a VA Loan Specialist on the Hawaii VA Loans team. 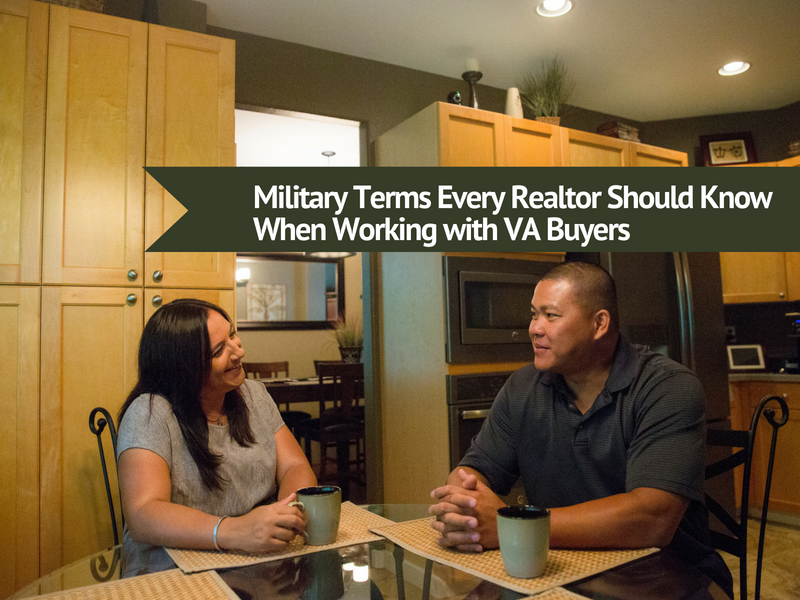 Even more, we’ve come to understand the many acronyms and verbiage that a military buyer will use when they sit down with us to discuss their current situation and VA home buying. The relocation of an active duty military servicemember – along with any family members (dependents) living with him or her – to a new permanent duty station (PDS). *Not a deployment or temporary assigned duty (TAD) or temporary duty (TDY). The official government documents that detail the servicemember’s travel timeline between duty stations and directs a servicemember’s detachment from their current command and arrival to their ultimate duty station. You will often find that standard PCS orders will assign a servicemember to a location for two or more years, however, there is always the possibility of orders written for less than two years. The month and year that a servicemember is scheduled to detach from a command or leave an assignment. The month and year that a servicemember will arrive to a new command or new assignment. Example: Captain Smith and his family are PCSing from Camp Lejeune, North Carolina to Marine Corps Base Hawaii (MCBH). His PRD from Camp Lejeune is August 2018 with an EDA of November 2018 to MCBH. Captain Smith’s PRD from Marine Corps Base Hawaii is November of 2021 with his next permanent duty station (PDS) to be determined at a later date. The equivalent of the head of a company or agency. Commanding Officers can be in charge of a variety of units within the military. The monthly allowance given to an active duty servicemember based on their duty station zip code, rank, time in service, and dependent status to occupy a home off-base. If a servicemember lives on base, their entire BAH will be paid to the contracted leasing company who provides on-base housing. A monthly statement, similar to a paystub, detailing servicemembers’ total pay, deductions, allotments, rank, time in service, and vacation days. The LES will also have the zip code that the servicemembers’ BAH is based on. To help offset the cost of living in higher cost areas like Hawaii, military members are eligible for a Cost-of-Living Allowance. COLA is a per-diem amount paid each pay period and changes every two weeks. COLA also varies based on rank, time in service, dependent status, and other factors such as whether the servicemember lives on-base or off-base. To begin the VA Loan Process, it is necessary for the veteran or servicemember to apply for their COE. Once obtained, this confirms to the lender that the buyer has the necessary entitlement for a VA loan. Separation from active military service typically occurs when someone reaches the date of their Expiration of Term of Service and are released from active duty, but still must complete their military reserve obligations. Upon separation, they receive form DD214 (see below), which indicates their former military service and their future status. Note: If ETS is within 12 months, we may not be able to qualify servicemembers with their military pay, unless we have verification that they plan to re-enlist with a letter from the servicemember, and a letter from their Commanding Officer (CO) that they are eligible to reenlist. DD Form 214 is the capstone military service document, as it represents the complete, verified record of a service member’s time in the military (Active and Reserve), awards and medals, and other pertinent service information, such as highest rank/rate and pay grade held on active duty, total military combat service and/or overseas service. Here, also, are the branches of service (Army, Navy, Air Force, Marines, Coast Guard) at the bases around Oahu. Note: It is not unlikely for someone in the Army to work at Joint Base Pearl Harbor-Hickam (JBPHH) even though it’s primarily a Navy and Air Force base. Therefore, your buyer may be looking for a home closer to JBPHH, not Schofield Barracks. Don’t assume you know where the servicemember wants to live solely based on their branch of service, just ask where they will be working! Make sure to save this post! This necessary information will help you in your work with military buyers. Don’t forget to check out our Agent Resources section for free downloads. As always, we’re available at 808-792-4251. If you have a military buyer or are a military buyer who is interested in getting prequalified for a VA loan, they can contact us or head on over to our loan application to get started. Who's Eligible for a VA Loan?